Attractive delicate looking red-yellow flowers hanging from stems. Flower appears to have five attached doves with the tail feathers hanging down. 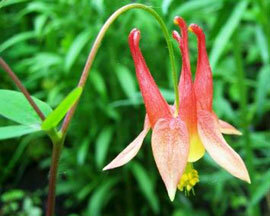 From the Latin “Columbine”. Prefers to be somewhat sheltered. Once established, adult plants can be in the full sun if soil is consistently moist. A definite must have plant for attracting hummingbirds. Delicate foliage makes it a beautiful contrast plant around rocks.